The Sorcery Code/Der Zaubercode is a Fantasy story combined with a language learning course. 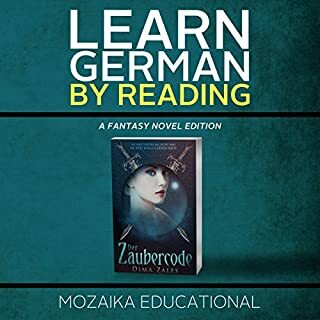 The audiobook consists of both the German and the English version of the story. In my opinion, mixing language learning and Fantasy proved a very good combination - it so much more motivating than reading through your standard workbooks for German, which often have boring stories. Here you have a great story, read by narrators with pleasant voices in a way that is easy to follow along and keeps you interested. As a native speaker of German I can tell you that even if you are not that much into Fantasy literature and still want to learn German, you should consider taking a look at this. The vocabulary used in the book is not too difficult and also very useful in all kinds of situations.